St. James’ Church in Calcutta is one of most elegant churches in the city, and the largest protestant church with about 600 accommodation in its prayer hall. Built in 1862, the twin spires of the St. James’ Church dominates the skyline. It is popularly known as Jora Girja (Bengali:জোড়া গির্জা), literally meaning twin church for its twin spires. The present church was built to replace an older one of the same name which was situated in Nebutolla Lane, near Amherst Street. This earlier church, built very much after the style and plan of St. Thomas’ Church, Free School Street, was consecrated by Bishop Reginald Heber on 12 November 1829. It appears to have fallen into a state of disrepair, due chiefly to white ants having eaten into the beams, and was declared unsafe for divine worship. An attempt was made to repair the building, but while the work was in progress, the roof fell in during the early hours of the morning of 23 August 1858, leaving the church in ruins. It was decided to abandon any further attempts to repair the Church as it was found to be very much out of the way, and a lot inconvenient for those attending it. The church authorities, therefore, resolved to build a new church in a more suitable locality and, in conjunction with it, a school for the children of the region. The first stone of this Church dedicated to St. James, was laid June 7th, 1862. Consecrated by Bishop Cotton 25th July, 1864. 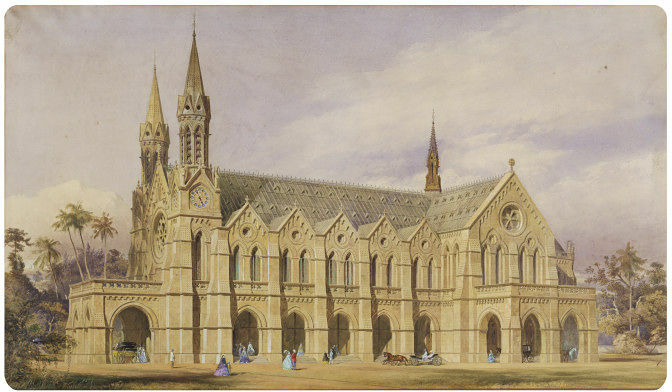 The above painting of Calcutta’s St. James Church was drawn in pencil and watercolor by Christopher George Wray in 1864. This entry was posted in Christianity, Customs/ Rites, Establishments, Ways of Life and tagged bishop cotton, Circular Road, nebutala, old calcutta, protestant church, st james church. My 4th Great Grandmother Badelia Berry had her ‘Burial Service’ @St James church 1849 – 9years before it was demolished. Badelia, her husband Captain Richard Berry, and their daughters were stationed at nearby Fort William. It looks quite difficult to get more about Mrs Berry from outside family sources. I wonder if her husband, Captain Richard Berry and the Captain Berry (b.1824, in Devonshire, England) who settled in South Australia in 1866 were the same person. Any idea? High Road Camberwell south London, buried Highgate Cemetery North London. He travelled the world, he fought in many battles. I think it is worthwhile to try India-British-Raj mailing community. You may consider sending a query with details to Roots-web British Raj. Perhaps you know already that it is:. For questions about this list, contact the list administrator at INDIA-BRITISH-RAJ-admin@rootsweb.com.